I wasn't really happy with these tiles. Many of them were not straight on the matte they are mounted to. I love the size but we have to do a lot of cutting to make them straight. Sheet Size: 12 in. x 12 in. Chip Size: 0.5 in. x 1.25 in. 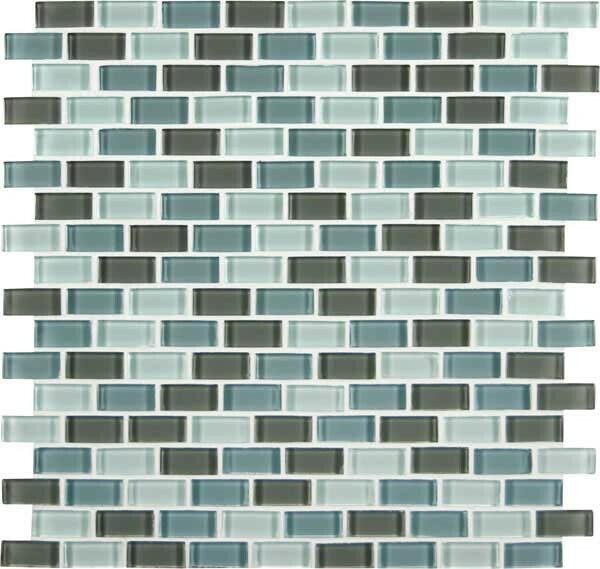 Majestic Ocean Crystallized Mini Brick Polished Glass Mosaic Tile for Bathroom Floor, Kitchen Backsplash, unmatched quality.These stunning mosaics are mesh-mounted and give a unique and dramatic effect. This tile can be used alone or as a gorgeous complement to ceramic and natural stone materials. We also carry Glass Mosaic Tiles on a mesh net in a lot of different colors. Matching 12x12 tiles, Moldings like pencils is also available.